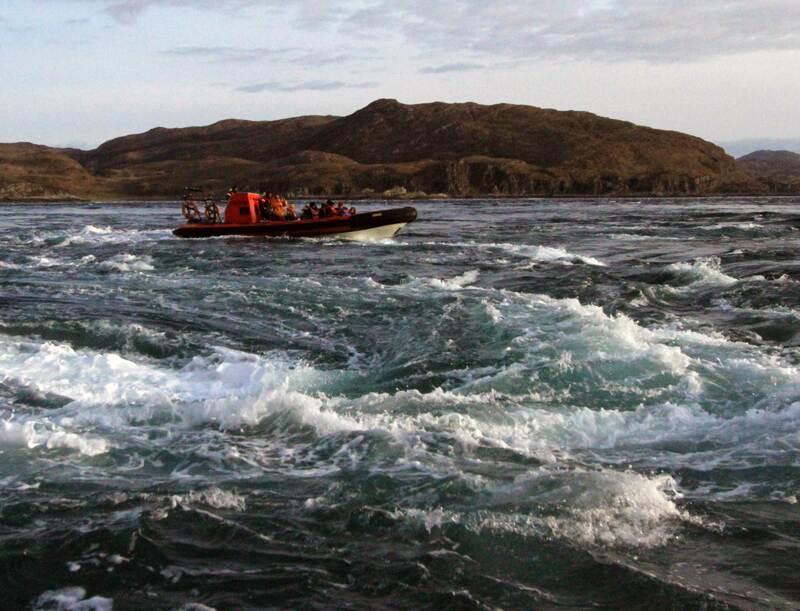 See the mighty Corryvreckan whirlpool at its best. These popular tours are designed to show the mighty "Corry" on big spring tides and occur approximately 30 times during our operating season. Our boat will depart Easdale and head directly to the narrow channel of water known as The Grey Dogs. Here it is easy to witness the difference in water levels between the sea on the inside of the island chain and the sea which is the Atlantic Ocean. From here we head directly to The Gulf of Corryvreckan to witness the flow of water as it reaches peak velocity. The affect at the whirlpool area is something to be witnessed. The whirlpools are greatly affected by recent winds and sea swell. The result is always dramatic. PRICES - ADULTS £48 and CHILDREN £38 - Family discount prices are available, please contact us for more information. Please note, we require minimum passenger numbers to confirm our trips - we will inform you when your trip has reached the required passenger numbers. The Corryvreckan Whirlpool (World's Third Largest). The tides flow because of the gravitational affect of the sun and the moon on the waters of the earth. The current flows swiftly and strongly in our area due to the geography of the islands. The whirlpools form due to the bathymetry of the area. There is a massive underwater obstruction to the flow of water which causes the whirlpools. 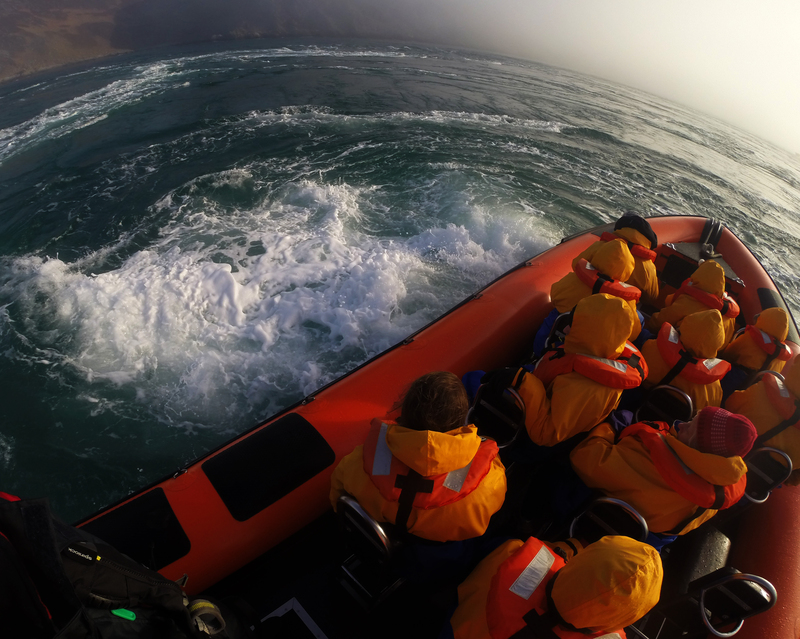 Our passengers get a close up view of a Corryvreckan Whirlpool. The Gulf of Corryvreckan where this happens is just one mile wide. The Scottish Association for Marine Science have worked with Seafari Adventures to monitor and research the tidal flow in the Gulf of Corryvreckan. Their conclusion, on a Spring tide when we run our whirlpool specials, is that a greater volume of water flows in the Gulf of Corryvreckan during a 24 hour period than passes out of the mouth of the Amazon River. We use our 10m Open RIBs for this tour. Our RIBs are designed and built at our own dedicated workshops and are the ultimate in RIB passenger transport. Every customer has an individual seat with dedicated foot rests and hand holds. The decks are above the waterline. Should we take any water aboard it will pass to the rear of the boat and back out into the sea. Our boats are powered by twin Yamaha 300HP engines which offers us comfortable cruise speeds of 25 knots. Our boats are able to go considerably faster - Hold on tight ! Our boats also offer excellent acceleration which aids their safe operation within the whirlpool area. Our Skippers are the company's best asset. They are highly experienced with many years service exclusively with Seafari. Our experienced skippers get you close to the Corryvreckan action. These tours only operate during Spring Tides (nothing to do with seasons, spring tides happen when we have a new moon and a full moon) when the tidal range is greatest. These trips are for the more adventurous. Although it is not our intention for you to get wet on these tours there is always a possibility due to the nature of the activity in the Corryvreckan. As these tours tend to be early morning or early evening it is likely to be quite chilly so you should dress appropriately - we provide full waterproofs. Please see here for more details on what to expect. We consider Whirlpool Specials unsuitable for children under the age of 8. As the tour requires us to be at The Corryvreckan Whirlpool at a specific time we emphasise the fact we are unable to wait for any customer who is late for departure. These tours are date and time specific to coincide with large spring tides.